TSNIITOCHMASH (Russian: ЦНИИТОЧМАШ) is a Russian industrial design bureau. TSNIITOCHMASH is a major designer and producer of weapons for the Russian military and MVD Internal Troops. The name is an initialism for Central Scientific - Research Institute for Precision Machine Engineering (Центральный научно-исследовательский институт точного машиностроения). TSNIITOCHMASH determines the development of and develops small arms and simulators for them, individual field equipment, conducts R&D on control systems for precision-guided munitions (as well as protection against them), field artillery systems and new materials. 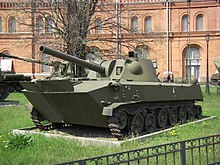 It also develops most cartridges, from small arms up to 14.5×114mm, for the Russian Army. ^ "Список аффилированных лиц". e-disclosure.ru. Retrieved 18 July 2017. "ЦНИИТОЧМАШ" [TSNIITOCHMASH]. tsniitochmash.ru (in Russian).